Tractor trailer drivers encounter many dangers on the job. You might be surprised to know that the dangers of the most common safety hazards drivers face are not only on the road. These dangers do not simply end as the drivers’ arrive at their final destination. Drivers are actually endangered by the many hazards that they face off of the road at the warehouse, dock, and construction sites. Drivers may be struck-by, crushed-between, or injured in another safety hazard. In the Midwestern states, between the years 2015 and 2017, it has been reported by the Bureau of Labor Statistics, that there were at least 96 fatalities related to truck transportation. Of these, thirteen involved coupling and uncoupling (attaching and detaching) from the rig. OSHA, the Occupational Safety and Health Administration, and the trucking industry are teaming up to prevent serious injuries and fatalities by raising awareness of the most common safety hazards. The most common safety hazards that drivers face are parking, backing up, and coupling and uncoupling the vehicles. Truckers and workers are taking important steps to improve safety by getting training that will target these most common safety hazards of the trucking industry. 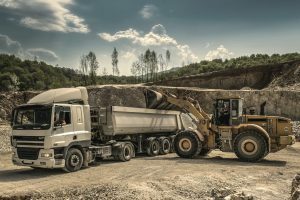 In their partnership, OSHA and the trucking industry created a flier that addresses safety issues including where to park, setting the emergency brakes, where to place wheel chocks to prevent rolling, and how to look for obstructions prior to backing up. People must be made aware of these dangers and how to avoid them moving forward. To find out more information about the most common safety hazards, visit OSHA’s trucking industry page. Employers have a responsibility to provide employees with the proper training and a safe and healthful workplace environment. OSHA’s role is to come alongside working men and women to ensure the health and welfare of workplace environments. OSHA sets and enforces standards, provides education, and assistance. Click here for courses that will equip employees with the knowledge and skills they need for the job.